Passionate about criminal justice reform? Justice Forward Virginia has the event for you! 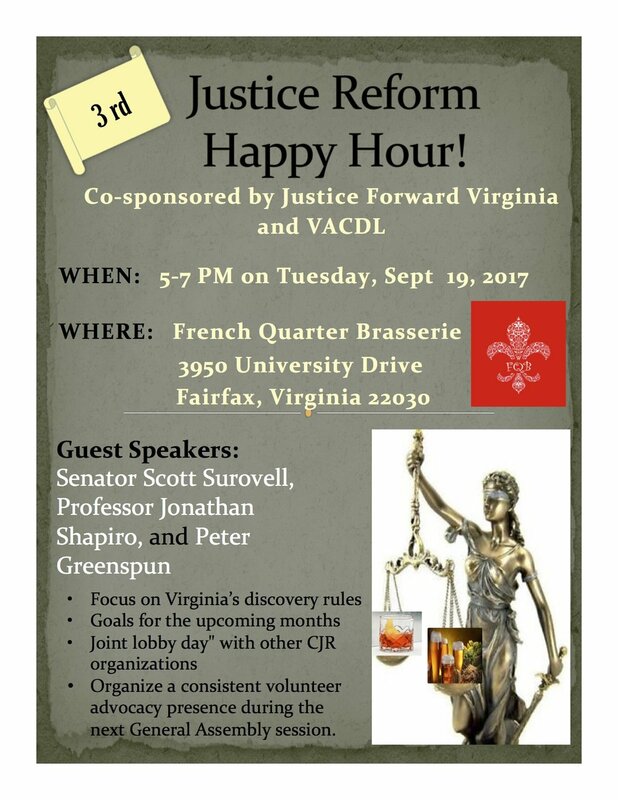 On Tuesday, September 19, 2017 from 5pm-7pm, join Justice Forward (and co-sponsor Virginia Association of Criminal Defense Lawyers) for its third Justice Reform Happy Hour, at French Quarter Brasserie in Old Town Fairfax City. In addition to hearing from our featured guests, Justice Forward will be discussing its goals for the upcoming months, including a joint "lobby day" with other CJR organizations, and plans to organize a consistent volunteer advocacy presence during the next General Assembly session. And if you can't attend, please add your name to our contact list so we can keep you updated about opportunities to be involved.